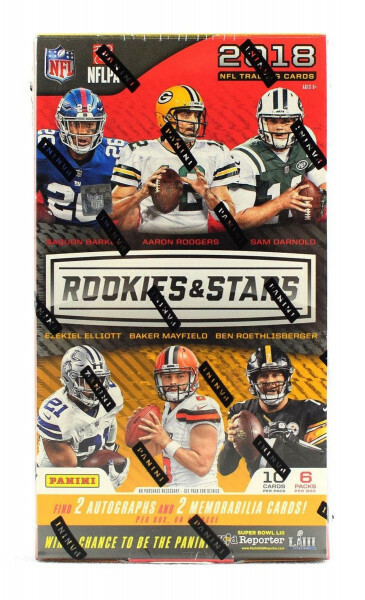 Factory Sealed 2018 Panini Rookies & Stars Football Hobby Box mit 6 Packs Per Box, 10 Cards Per Pack. In jeder Box: 2 Autogramme, 2 Memorabilia Cards, 5 Parallel Cards, 22 Insert Cards, 12 Rookie Cards und 2 Opti-Chrome Insert Cards, im Durchschnitt ! Produktinformationen "2018 Panini Rookies & Stars Football Hobby Box NFL"
In jeder Box: 2 Autogramme, 2 Memorabilia Cards, 5 Parallel Cards, 22 Insert Cards, 12 Rookie Cards und 2 Opti-Chrome Insert Cards ! Look for rookie jersey autographs in Dress for Success (max #'d /99), which parallels to Prime (max #'d 25) and Laundry Tag (#'d 1/1) versions. BASE: Chase a 100-card base set of all the top players in the NFL. Hunt for all the different parallels, which include True Blue (#'d /49), Red & Blue (#'d /25), Gold (#'d /10), Black & Blue (#'d /5) and Platinum (#'d 1/1). ROOKIES GOLD: Find all the top rookies from the 2018 draft class, look for their parallels, which include, True Blue (#'d /49), Red & Blue (#'d /25), Gold (#'d /10), Black & Blue (#'d /5) and Platinum (#'d 1/1). ROOKIES LONGEVITY SIGNATURES: Find Longevity Signatures of all the best rookies, which parallel to Rookies Longevity Signatures Blue (max #'d /75), Rookies Longevity Signatures Purple (max #'d /25), Rookies Longevity Signatures Gold (max #'d /10), Rookies Longevity Green (max #'d /5), and Rookies Longevity Platinum (#'d 1/1). CRUSADE SIGNATURES: Look for the always popular staple of Rookies & Stars with the Crusade insert which parallels to Red (#'d /99), Pink (#'d /85), Purple (#'d /55), Gold (#'d /10), Green (#'d /5), and Black (#'d 1/1). New to 2018 Rookies & Stars chase a limited number of autographed Crusade inserts. GREAT AMERICAN HEROES: Heroes both on and off the field Great American Heroes highlights the best of the best. These inserts parallel to Red (#'d /99), Pink (#'d /85), Purple (#'d /55), Gold (#'d /10), Green (#'d /5), and Black (#'d 1/1). New to 2018 Rookies & Stars chase a limited number of autographed Great American Heroes inserts. STATISTICAL STANDOUTS SIGNATURES: Highlighting some of the greatest statistics the NFL has seen this limited edition autographs insert will be a chase for every collector. Statistical Standouts Signatures (max #'d /99) parallels to Blue (max #'d /25) and Platinum (#'d 1/1). TEAM DUALS PRIME: Find memorabilia cards of some of the best up-and-coming stars the NFL has to offer with Team Duals (#'d /99), Prime (#'d /49) and Laundry Tag (#'d 1/1). DRESS FOR SUCCESS PRIME: Look for Dress for Success jersey autographs of all the best rookies in the NFL. 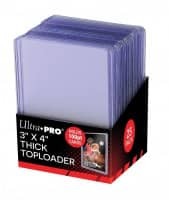 These parallel to Prime (max #'d 25) and Laundry Tag (#'d 1/1). 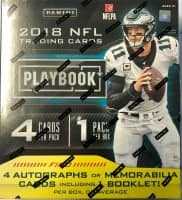 Weiterführende Links zu "2018 Panini Rookies & Stars Football Hobby Box NFL"
Fanbewertungen für "2018 Panini Rookies & Stars Football Hobby Box NFL"